ITW Picatinny QASM RAMP in Tan and black now in stock. 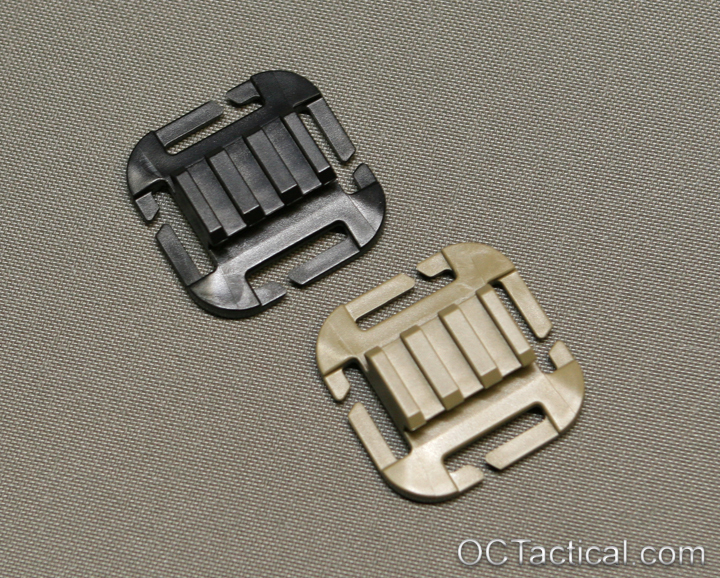 ITW 1.5″ TSR Buckles and 1.5″ Triglides also added to the store. ITW Picatinny QASM-RAMP (Quick Attach Surface Mount – Rail Accessory Mounting Platform). The Picatinny QASM-RAMP is designed to mount, hold and/or organize any/all of your M1913 Picatinny mountable accessories. Introduce this ultra-modular capability to your kit for unlimited mounting options in any location containing 1” sewn webbing. The Picatinny QASM-RAMP can be used in numerous scenarios, whether it is mounting your incident camera, flashlight, organizing your range bag, or storing your optics and other accessories. The Picatinny QASM-RAMP features a large base surface area for supporting heavy accessories and is designed to expand your mounting options beyond your weapons and helmet rails. Your sidearm rail-mounted flashlight can now be used anywhere. Convert your systems using the Picatinny QASM-RAMP and your options and modularity are endless.